Roland Van Deusen ’67, G’75 outside the Syracuse VA Medical Center. Veteran suicide rates have increased 25 percent over the last decade, with veterans more than twice as likely as non-vets to take their own lives. Roland Van Deusen ’67, G’75, a former U.S. Navy petty officer and retired psychiatric social worker and drug counselor, self produced a video PSA message aimed at struggling veterans, urging them to forgive themselves for human emotions resulting from inhumane experiences. It’s also a tool for their families, friends and counselors. 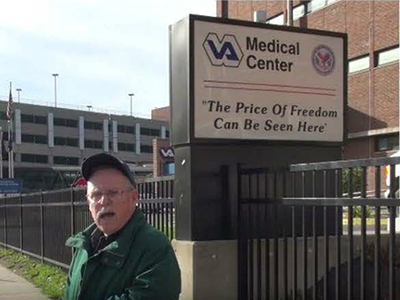 Filmed on the Syracuse University campus and nearby Syracuse Veterans Administration (VA) Medical Center, the video has been widely circulated online, including on the Psychiatric Times website, and is used by used by staff at the VA National Center for Post-Traumatic Stress Disorder (PTSD), the VA’s nationwide suicide prevention program, among others. As a result, Van Deusen was recently invited to join the Veterans Administration COVER (Creating Options for Veterans Expedited Recovery) Commission, an 18-month legislated commission focused on veteran mental health. The video caps a decade of Van Deusen’s advocacy efforts for veterans. The College of Arts and Sciences caught up with Van Deusen to ask about his history and motivation. Tell us about your own military service. I enlisted in the Naval Reserve my junior year of high school to get out of a public housing project, Maywood Terrace, in Watertown, New York. I won a scholarship that would pay 80 percent of the tuition at Syracuse University, but had to extend my enlistment in the reserves for four years in order to get my degree. I majored in sociology with a minor in psychology. Once a week, I worked at the Liverpool Naval Reserve Center and had to do two weeks a year either at boot camp or on a ship. When I graduated, I had a two-year active duty obligation. I was trained as a navigator and volunteered twice for river patrol boats in Vietnam, but got turned down twice due to poor vision. I spent a year in Iceland in charge of a barracks of 300 guys who ran the radar site and a year on a food supply ship in the Mediterranean. I got to go to Italy five times, to Spain three times. And I got to help navigate across the Atlantic Ocean and all through the Mediterranean. What was your feeling about the Vietnam War at that time? While I was serving in the military, I felt that whatever happened to me would be worth it if my beloved country could be at peace again. But I could see that things were going the wrong way and personally felt that Lyndon Johnson sold out the guys that were over there. By 1969, I was back and had started demonstrating against the war. The subsequent wars—which have proven themselves to be endless and winless—have only increased my sense of betrayal. We’ve had more than 300 local GIs killed who were stationed at Fort Drum or who came from the North Country. How many more were wounded? How many more were traumatized? Your professional career gave you a lot of insight into the emotional issues facing veterans. How did your career evolve? When I first came out of the service, I returned to Watertown and got a job with Jefferson County as a case worker in the children’s division working with foster care, and later set up and ran a drug counseling agency. After five years, I decided to use my GI Bill benefits to get a master’s in social work, so went back to Syracuse. I worked in local psychiatric hospitals while I was in graduate school and spent the next eight years as a psychiatric social worker. In 1984, I went to work in the state prison system, where I discovered I loved doing drug counseling. I supervised treatment at Hale Creek Correctional Facility, the first prison accredited for substance abuse, and ran treatment at Cape Vincent Prison, at the time the largest inpatient program for substance abuse. My wife, Nancy, set up the substance abuse program for incarcerated veterans at Cape Vincent, and I later took it over. When did the advocacy work start? In 2000, I retired from Cape Vincent Correctional Facility. Because I was never able to get to Vietnam, I always felt like I didn’t do all that I could have. Now that I was free, I felt like I needed to do for my fellow veterans what they would do for me. My focus with the volunteer work was to prove that peace is also patriotic by honoring the warriors not the wars. I’m involved with several organizations, including Veterans for Peace. It started out with lobbying. I was reading a lot about guys who served in Desert Storm getting sick from depleted uranium contamination so I became involved in the lobbying effort that got Governor George Pataki to sign the bill providing coverage for depleted uranium for New York State Reserves and National Guard. There was a federal bill, too, but that did not pass. I heard about local military spouses losing their education benefits so started a protest that spurred Congressman Owens to lead a successful effort in the House to restore benefits for 90,000 such students nationwide. I also got property taxes lowered for county veterans. A lot of your efforts have focused on PTSD. I understand that because of my work as a psychiatric social worker and counselor. I ran a 12-step program at my church and through the years discovered that approach was also helpful for folks with PTSD. I’ve helped start five anonymous PTSD support groups in the Fort Drum area and another in Clayton, and have helped train all of the police agencies in the Fort Drum area about PTSD. I was also part of a successful effort to keep a civilian-run PTSD clinic at the local hospital open for Fort Drum soldiers. After a Fort Drum soldier told me he’d lost 12 men in his unit to suicide, I started working on efforts to implement universal military discharge mental health screening. I’m hoping the COVER Commission will help with that. Van Deusen’s video message to veterans with invisible wounds can be seen on YouTube.